Future plans for Louise McKinney Riverfront Park include the construction of new and improved plaza spaces and a restaurant space (subject to funding). The restaurant space is intended to offer a full-service dining experience. It will be family-friendly, open year-round and offer both indoor and outdoor seating opportunities with views of the river valley. The next phase of construction in Louise McKinney Riverfront Park began in 2015 and marked the completion of the Green Room (located beside the Shumka Stage). In 2016, the City completed park utility upgrades. In 2018, the new barrier-free shared-use path, staircase and lookouts (linking the upper parking areas to the lower levels of the park) were opened. This work also included lighting and landscaping elements. The current design explores the following amenities and features. Note: construction of each item is subject to funding. In addition to major capital projects in our parks, smaller scale activities occur throughout City parks, learn more about them. Establishing goals for the development and management of our Ribbon of Green. A 10-year strategy to define locations and guidelines around building riverside amenities within Edmonton. Louise McKinney's Poetry Rings won an Urban Design Award in 2009, find out more about the awards. 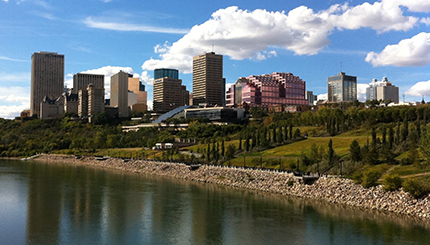 See the River Valley from a different perspective with a riverboat tour.